Many 3D printers get funds required to start the production through Kickstarter and we covered some of the projects such as the Micro, which is the most funded kickstart 3D printer. However, most of these printers come with a small printing volume, which halt the capabilities to print with large size. Unlike the traditional 3D printers, the delta printers’ design and structure enables printing with a large volume such as the 3D PotterBot printer that can be used in printing clay and even cement. Another 3D printer based on the delta design is the Krak3n 3D. 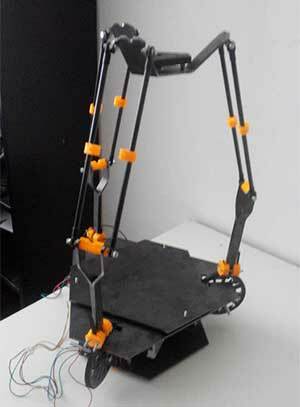 The new 3D printer is planned to appear on Kickstarter by the next April 2015. The printer is made by team of four experts with the goal to overcome challenges found in the other 3D printers including the volume size. The new Krak3n 3D printer is built to have a unique design, and easy to use for both beginners and professionals. 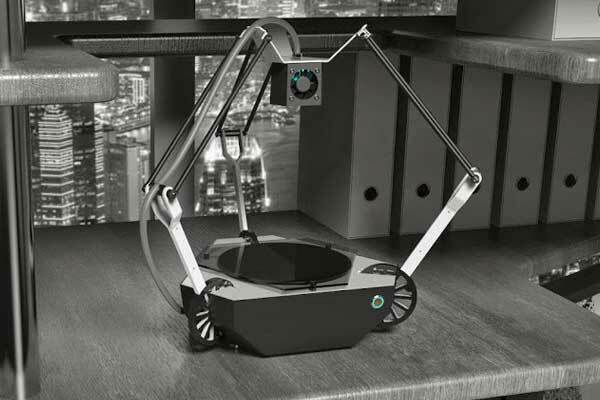 Additionally, the new 3D printer includes a laser engraver and 3D scanner, which can save the money for buying a separate 3D scanner or laser engraver for your studio. The Krak3n 3D printer is also supported with an automatic calibration feature that allows th printer to check the print surface and modify the printing paths using the calibration information. This can help the printer to provide high printing quality and avoid problems that may occur during the 3D printing process. The 3D printer is also supported with printgaurd feature that allows detecting the filament flow. if the filament runs out, it pauses automatically and continue the printing after feeding the printer with filament again. The new 3D printer is also supported with modular design, which allows the users to upgrade to different modulars such as dual extruder, laser engraver and drawing module. Other modulars are expected to be delivered such as the paster extruder, Chocolate extruder and CNC engraver. In addition to the above features, the Krak3n provide real time monitoring and user friendly interface to control the 3D printing process. Based on the Krak3n website, the printer provides high value, portability and versatility comparing with other 3D printers. its speed is moderated comparing with the other competitors in the market. The Krak3n is one of the new 3D printers that does not just cliché the existing model, the team tries to provide a different printer with extendable capabilities, which will be counted as a advantage once the 3D printer is launched to the market in the next few months.